This blog originally appeared on The Project Heal blog. I entered this field and worked for eight years in a medical hospital setting, caring for highly medically compromised adults with anorexia nervosa. In retrospect, practically every interaction I had with patients took place in a totally controlled environment. They were patients who, for their clinical teams at home and loved ones, were in fearsome danger of death. Their vital signs, laboratory values, nutritional intake, and bodies were all as unsafe as could be imagined. And yet, once they were admitted to the program I had helped run on a daily basis for so long, I knew they would be okay. Enveloped by expert professionals, introduced to carefully designed clinical care pathways, guaranteed to be monitored and nourished, my hospital patients were safe. Can’t get out of bed on her own due to weakness? There’s a nurse’s aide by her side all night long so she doesn’t fall. Overcome by anxiety? Their psychologist who sees them daily will be here this afternoon. In the hospital setting, I could go home every night content in the knowledge that every one of my patients was in good hands, eating, getting electrolytes tuned up, taking medicines. As a result, I don’t remember spending a lot of time on the age-old clinician-patient duel: “You need to eat.” “I won’t eat.” I could, instead, sit and share favorite passages from poems with patients, to help soothe the anguish of their eating disorder voices. I was an English major in college, and poems are a part of who I am. “My own heart let me more have pity on…Maybe at last, being but a broken man,/ I must be satisfied with my heart,” counseled W.B. Yeats. “It is always a matter, my darling,/ Of life or death, as I had forgotten. I wish/ What I wished you before, but harder,” marveled Richard Wilbur. I sat with my patients and, yes, talked medicine. But I also indulged in developing metaphors to clarify their physical and emotional experiences. In listening to their stories, I learned some of the archetypal narratives that can culminate in an eating disorder. I connected with that depleted, brilliant, sensitive, exhausted, and captive audience of my hospital program, in the luxury of knowing they were getting exactly what they needed. 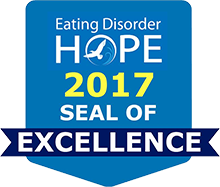 Now I’m an outpatient doctor and founder of a medical clinic dedicated exclusively to people with eating disorders and disordered eating. I now serve a less medically compromised patient population, but I have far less control over my patients’ lives. My patients might see me for a half an hour a week, and their therapist and dietitian another hour a week apiece, and the rest of the week they are on their own. The rest of the week, their eating disorder gets to have full access to their extraordinary minds. No one is making sure they eat enough, or don’t purge, or don’t use their substance of choice, or get enough sleep, or take their meds, or avoid triggering interactions. And while they are less medically ill than my former patients were, my patients now clearly still experience significant challenges. The patient who has lost a bunch of weight after leaving residential, is binge drinking, and refuses to step back up to a higher level of care. The patient who has abdominal distention and pain that does not improve no matter what workup I arrange, no matter what evidence-based treatments I prescribe. The patient whose borderline tempests simultaneously pull me into the tumult of need even as they reject and revile me. They’re all my outpatients. I used to have thirty minutes a day, every day, for a week or so, with terribly ill patients in an almost perfectly controlled setting. And now I have thirty minutes maybe once a week, for as long as they’ll keep me as their doctor, with patients who are both physically ill and struggling with concurrent mental illness, in a relative wilderness of a setting. Sure, we talk in comfort of my office, but in a medical catch-and-release, I then have to let these fragile, tenacious individuals back into their lives for the rest of the week. I have sat, looking into the stormy eyes of a furious young man whose team has set boundaries that trigger his abandonment fears, thinking to myself, “Stay in scope of practice. He has a mental health provider. You’re his internist.” I have learned to say, “I hold space for this emotion. It feels like something you need to discuss with your therapist.” At times, I’ve reflected with heartsick disappointment on the somatic suffering I was not able to ameliorate, or even diagnose. I’m supposed to be an expert. That’s why they came to me. I wanted to give them answers and instead could only bear witness to their suffering. This is what I didn’t get in the hospital setting. Because when patients left for residential programming, I didn’t get to hear the rest of their stories. The narrative arc, different for each patient, always started with near-death starvation and ended with one chapter of recovery done, the rest of the novel to come. Now, despite the lack of control, the trepidation I feel as I say farewell till next week, the utter uncertainty of it all, I get to read the whole book as they write it. I founded my clinic because I have the privilege of venturing into the unknown. I deliberately left a secure position to create something novel, both for patients and for the remarkable people I work with. For the former, a greater opportunity to work on recovery while experiencing daily life, with its triggers and unique motivations. For the latter, a workplace founded on feminist principles and good boundaries. We can throw ourselves into work with a fierce joy and passion, and then at the end of the day fully engage with partner, family, and interests. Robert Frost wrote that he would not relinquish to time “The things forbidden that while the Customs slept/ I have crossed to Safety with. For I am There,/ And what I would not part with I have kept.” As I wrote this I realized: it turns out that there is more safety in this less safe setting than I could have imagined.